I can't say enough about the Baby K'Tan! I was looking for a carrier, but couldn't decide on which one to get since there are so many out there! I visited A Mother's Boutique in Wexford, and Judy helped me with the Baby K'Tan. I was able to try it on, and get a feel for it before I invested in it. 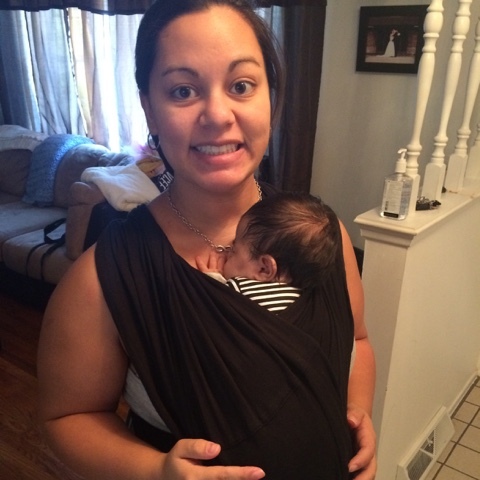 I've watched videos, and have seen others use the Moby wrap, but I wanted something just a little easier that I could just throw on. I bought the original in black in a size medium. The instructions were very easy to follow, and I was wearing my baby girl the next day. As for my baby, She LOVES it! She calms down quickly, and always falls asleep. It's helped me get so many things done, and now I don't feel like I'm just sitting around the house. As for washing, it's easy too! I've washed it once already, and the material is still just as strong. I would definitely recommend the Baby K'Tan! I'm still going to give the other carriers a try because I want to really want to compare them. Let me know what you guys recommend!